That phrase is one of the memorable words I learned to program in Computer Programming class. And those exact words is what I would like to greet you all with in my first post here as a guest blogger. I am very much excited to share some of my thoughts and experiences here and I do hope we all could exchange ideas along the way. 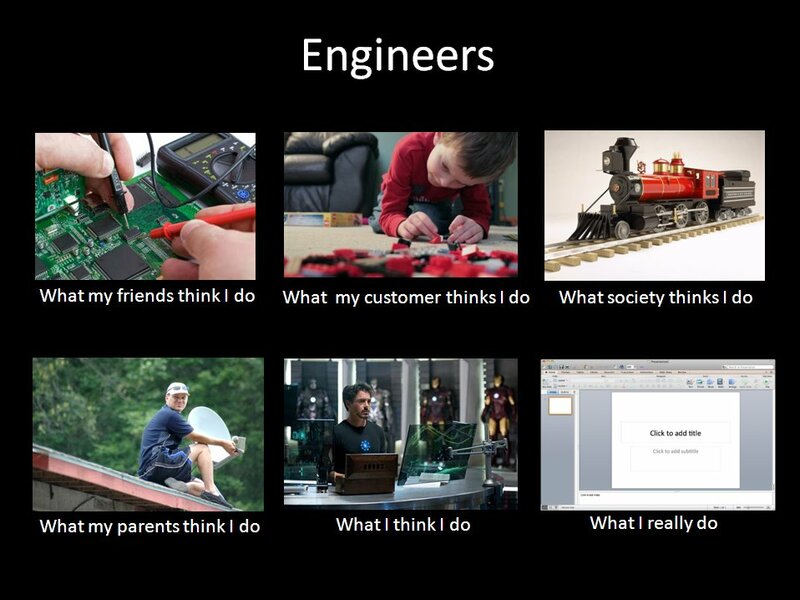 In the past few weeks, we've seen these meme about "What others think I do vs What I actually do..." one too many times. Most of these reproductions are really funny, quite to an extent that it is a chilling truth that we hate to admit. Engineering is a very large field and perhaps not many of our non-engineering friends/relatives would understand the nature of our jobs, unless they don't doze off or look at us with a puzzled face when we start explaining to them what we specifically do in the best of lay-men's terms. And with that said, electrical engineering also covers a large spectrum of variety of jobs. In university, I am a power electrical engineering student. Trained as an RF circuit engineer at work and finally moved on as a microelectronic engineering postgrad student. However, my dad still insist in thinking that I have the credibility to do electrical wiring for the whole house. Many of us joined the engineering work force with high expectations; working on the latest technology, being part of the innovation and helping the community achieve greater heights with the technology that we provide. It was really a great place to be for fresh graduates who had high hopes and ambition for the whole mankind, like me. Then somehow, it seems that the longer you work, the more meetings you had to attend. More time spent on creating presentation slides rather than creating the stuff that you like. We start wishing we had more time to do research or more time to properly sit down to think and analyse our work. Slowly, we start to think that we are surely losing the initial feeling of passion we had last time. Maybe the word "Engineer" has been too "Romaticised". We tend to associate engineering with the likes of those great engineers/innovators like Edison, Tesla or maybe Tony Stark. Literature or fiction only highlights the meaningful events of a person's life. I bet these great people also had their fair share of attending dull 2 hour meetings and felt like they don't have enough hours in the day to sort out the thoughts in their head because they're too busy doing side-tasks. I guess what I am trying to say here is that (and I know it sounds cliché), but these dull moments shall pass. How you go through that period of grey skies depends on your attitude, how you manage your time and your productivity levels. If that doesn't work, why wait for something to happen? Instead, be proactive and do something to spark that passion for engineering again. Have you ever entered the Engineering field with a certain mindset and only to find out that everything is far from what you expected? Any tips to share on how to fire up the passion of engineering again?